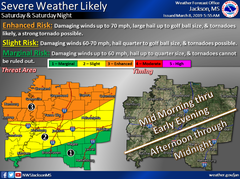 Enhanced Risk of Severe Weather tomorrow Saturday March 9th. Winds up to 70 mph, large hail to golf ball size and tornadoes likely, strong tornadoes possible. 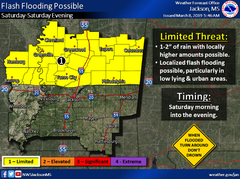 1-2 inches of rainfall with locally higher amounts possible. Localized flash flooding possilbe in low lying and urban areas. NOW is the time to prepare for this possible severe weather event! !